Dr. Hassan Diab is a Canadian citizen and sociology professor in Ottawa who has been living a Kafkaesque nightmare since November 2008. France is seeking his extradition to question him regarding a bombing in Paris in 1980. Hassan is not charged with any crime, yet he has been living under very strict bail conditions that include paying $2,000 per month for a GPS device he is required to wear at all times. In 2011, a Canadian judge decided to commit Dr. Diab to extradition based solely on a handwriting analysis report that alleges that Hassan’s handwriting resembles five words on a Paris hotel registration card from 1980. Five internationally renowned handwriting experts testified that the report is based on fundamentally flawed methodology and is patently unreliable and biased. The extradition judge himself described the handwriting analysis report as “very problematic”, “very confusing”, “convoluted”, and with “conclusions that are suspect”. Yet the judge ruled that he is required under Ontario’s interpretation of Canada’s extradition law to commit Dr. Diab for extradition. Several months after the judge’s decision, French authorities revealed that they have not decided whether to place Hassan on trial, and that he is only sought for investigation purposes. Despite this revelation, in 2012 the Minister of Justice, Mr. Rob Nicholson, signed an order surrendering Hassan to France. Hassan is appealing the extradition decision and surrender order. The appeal will be heard by the Ontario Court of Appeal in Toronto on November 4 and 5, 2013. Amnesty International, the British Columbia Civil Liberties Association, and the Canadian Civil Liberties Association have filed interventions with the court, expressing their deep concerns about Hassan’s case. Dr. Diab’s case points to glaring problems with Canada’s extradition law. In extradition cases, the Charter rights of the person sought are severely compromised. Canadian standards of evidence do not apply. The standard for extradition is so low that Canada hands people over to other countries based on evidence that is not acceptable in Canadian courts. Canada has extradition treaties with countries that allow secret intelligence, including intelligence that may have been the product of torture, to be used as evidence at trial. Evidence submitted by the foreign country is presumed reliable. In addition, foreign countries may cherry-pick what evidence to present to Canada, and need not disclose any exculpatory evidence. For example, at the extradition hearing, Hassan was not allowed to introduce evidence showing that his finger and palm prints do not match those of the presumed bomber. Every citizen should be concerned about this grave injustice. If it can happen to Hassan, it can happen to any one of us. 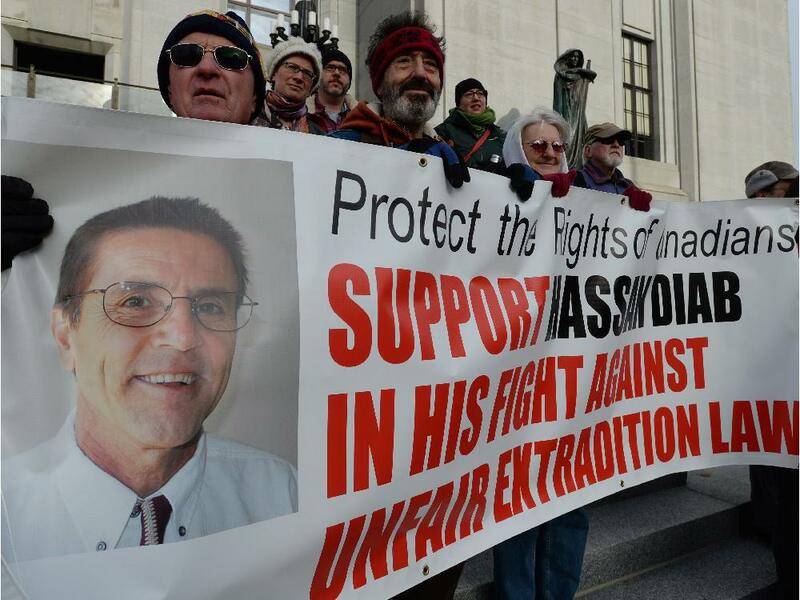 Please help us mount a public campaign to reform Canada’s unfair extradition law and support Dr. Hassan Diab.